Honor someone in a way where their tribute can be a testament to helping people. Remember a deceased loved one in a way their memory survives them by blessing people in need. 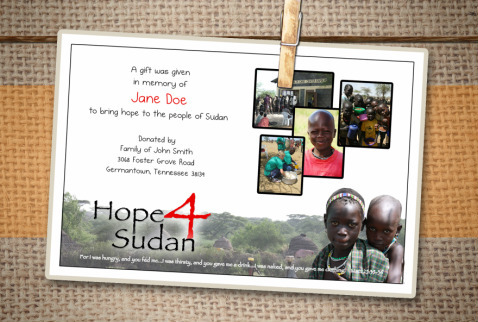 Donate to Hope4Sudan and we will notify your honoree with a tribute card, or the family of the deceased with a card telling them a donation has been made in the loved one's memory.